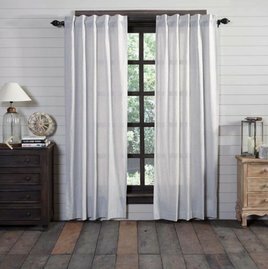 The Cape Cod Prairie Curtain Set invites a sheer appearance for light, transitional look to any room. Featuring a woven stonewashed blue ticking stripe on creme creating a coastal look. 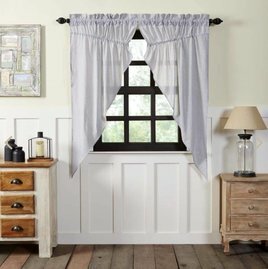 The Cape Cod Panel Set of 2 84x40 invites a sheer appearance for light, transitional look to any room. Featuring a woven stonewashed blue ticking stripe on creme creating a coastal look. Includes 2 matching tie-backs.